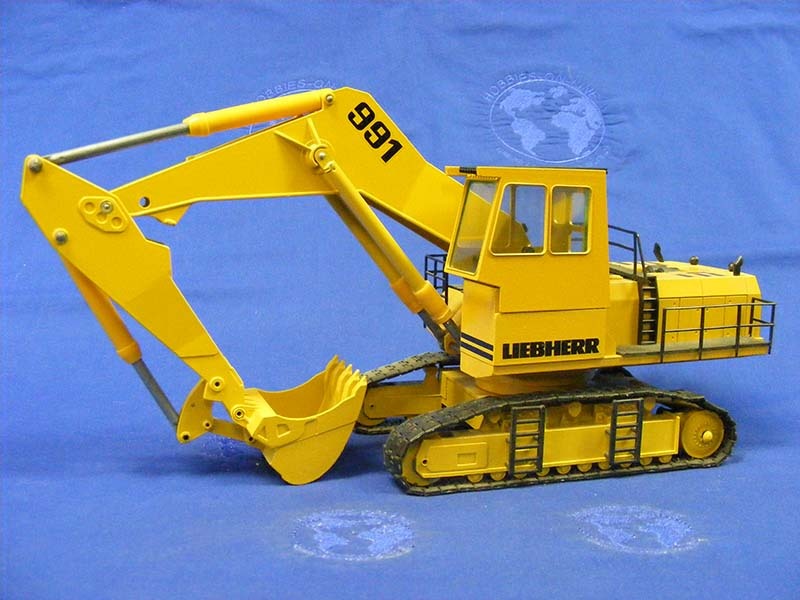 The 1:50 Conrad Liebherr R911 Track Excavator is one very intriguing diecast model. 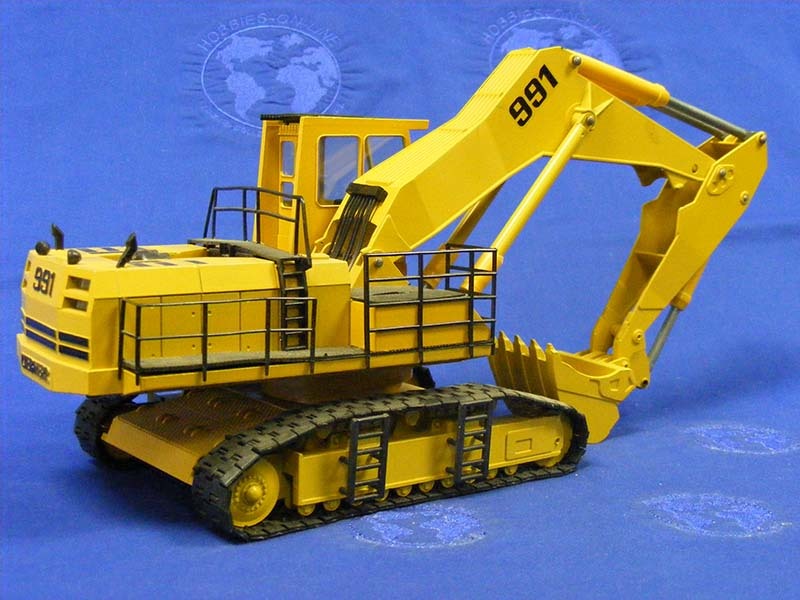 It might not be representing a new excavator but that doesn’t stop it from being a great addition to the collector of diecast construction equipment models. 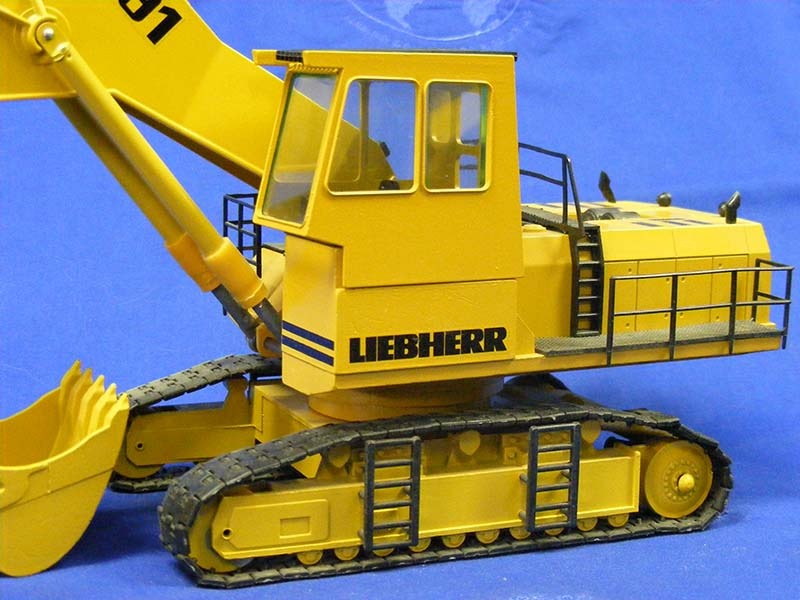 The Liebherr R911 is actually a quite old excavator. It was first introduced in 1981 and was in production for a relatively long time. The excavator is suitable for a variety of construction projects and even light mining. It weighs 160 tones and is capable of excavating large amounts of earth quickly and efficiently. The R991 is very durable and can withstand a continuous workload. All this made it quite popular and helped with its long life. Of course it’s not sensible to get a real one as it’s expensive and well, if you’re not digging, you’re not needing. But you can get the 1:50 Conrad model of it and commemorate the R991 and have a great diecast construction model for your collection. With this being said it’s time to take a more detailed look at the model. The images of it are provided by Buffalo Road Imports. Even at first look the model is very impressive. It’s good in size and quite heavy and sturdy. The reason for this is quite simple. It’s well made and entirely metal. The said metal is beautifully crafted with great shapes and lines throughout. Even the smallest of details are present and well made. The bucket and entire arm are metal including the struts and supports. They rely on realistic hinges that mimic the actual movement of the bucket and arm. Also notable are the tracks. They are metal and fully working. The tracks are mounted on realistic wheels that provide excellent work of the tracks. The upper part of the 1:50 Conrad Liebherr R991 is mounted on a rotating platform and then onto the tracks. This way you can rotate it 360 degrees with no worries. The rotation is smooth and yet very stable and sturdy. There are nice steps are guard rails throughout the model with them being a combination of plastic and metal bits. Also visible are the exhaust pipes and a few other bits and pieces. The cabin is a bit plain and modest. There aren’t a lot of details in it which is relatively typical for diecast construction models. Looking the model from the back reveals a whole new set of details. Like the operating cables and pneumatic tubes that rise from the main body and go into the excavator arm. The back of the model also features a very well made vent and realistic LIEBHERR and 991 lettering that is raised from the body and not simply a sticker. 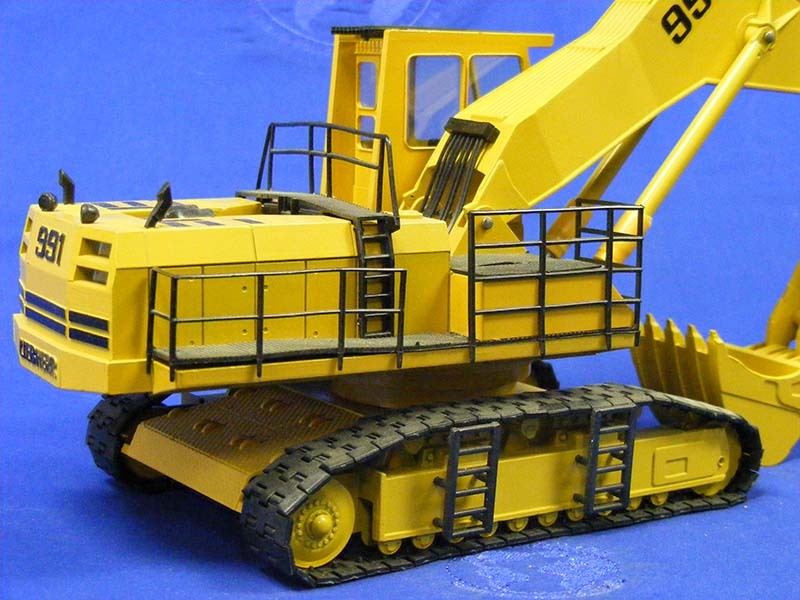 So while the model might be representing an old excavator, it does offer a great amount of details and features that make it a superb addition to your diecast construction model collection.